Check out our page of testimonials. Not all testimonials come at the end of the job, as standard notes. Here is an e-mail that was sent the day the kitchen cabinets were installed. Here is the completed kitchen Steve & Paige were all excited about. The two splurges, raised panel ends on the wall cabinet and the glass cabinet above the microwave, are both up at eye level for maximum impact in this kitchen which was done with a sharp eye on the budget. 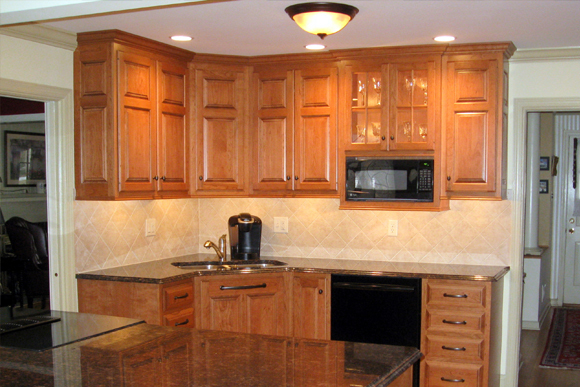 The custom cabinetry is executed in cherry with a pillow raise on the door panels. Note the large door handle below the sink which works double time as a towel bar. This entry was posted in Kitchens and tagged Kitchen Remodel, Money saving, Wayne. Bookmark the permalink.